NAUTICALweb - Pershing 115 Co.d.a.g. How many shades of meaning can the term exclusive have? Several, though the etymology of the word leaves little space to interpretation. 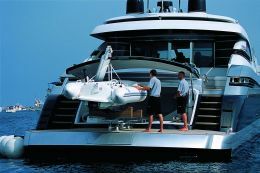 Owning a thirty-five-meter megayacht, in fact, offers by itself a good dimension of its meaning. How many could own her? Even though the market of 24-meter and longer yachts is expanding all over the world, the Owners are still an élite, a limited number of fortunate people who can surround themselves with exclusive objects. So, owning a Pershing 115 is by itself high-class, destined to the few, but among these there is someone who demanded more. An Owner wanted to customize this privilege by requesting an important technical modification to his yacht, which strengthened the brand name turning the yacht even more exclusive. Estimated maximum speed: 55 knots. For further information, contact Pershing: viale Marche 2/4; 61030 Castelvecchio di Monteporzio (Pesaro, Italy); tel. 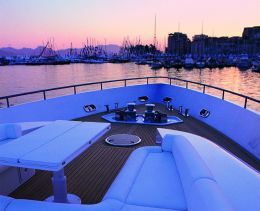 +39 0721 956211; fax 0721 955784; website www.pershing-yacht.com; e- mail address: info@pershing-yacht.com. That is how the Pershing 115 with gas turbine was born. The 35- meter Open mega-yacht is powered by a mixed engine, defined as COmbined Diesel And Gas turbine (CODAG), made up of two conventional engines/water jets as in the standard version (two MTU 16V 4000 M90 engines totaling 7,400 hp and KaMeWa 71 SII water jets) with in the middle a Vericor Power Systems TF 50 gas turbine specific for marine propulsion, with Maag transmission and a 56BII Kamewa water jet offering an extra power of 5,000 hp capable of significantly changing the speed of this "large" yacht. So, while the standard version reaches a maximum speed of 42 knots this yacht may reach a speed of 55/56 knots - this speed is estimated for at the moment the yacht is still being fitted out in the yard. This is not an absolute innovation for there are vessels, including Pershing ones not only destined to the pleasure market, with gas turbine engines. The exclusiveness of this yard's flagship version that deserves special attention is the installation of both types of engine, the traditional diesel one and the gas turbine with water jets. On this matter we interviewed Tilli Antonelli, the Pershing President and Naval Engineer Andrea Frabetti, the vice-president of Ferretti Engineering, the group which includes all the trademarks of the Forlì-based company contributing to boat design. First of all, what drove the yard to build this "fast" version of the 115 footer? When I first thought of the 115 footer, said Mr Antonelli, I considered that this model should have faster versions than the standard one, eventually with three conventional engines or, why not, even with a gas turbine. Because of this, we requested the designers, to create a hull with adequate size and scantlings, capable of supporting exceptional stress and an engine room large enough for power upgrading. The "gas turbine" solution is potentially capable of totally changing the type of yacht, greatly increasing speed and sensations. In this way an Owner may have his yacht without waiting a year; the changes can be easily made because they were taken into consideration in the early design phase. Thanks to this forethought, when a client asked for a faster Pershing 115 for himself it was not difficult to satisfy his request. How was that done, did you just install the gas turbine? That was done without making the slightest change to meet the client's request on a yacht that had already been conceived for this solution. The waterlines, the scantlings, the engine room, the interior layout remained the same. We just slightly, almost imperceptibly, moved aft the hull's center of gravity and this is not a negative feature for a boat destined to navigate at high speed. As fuel consumption would definitely be higher, were you forced to install greater fuel tanks? No, the standard version has tanks for a total capacity of 16,000 liters because we anticipate or consider that the gas turbine would not be used all the time to avoid high fuel consumption. 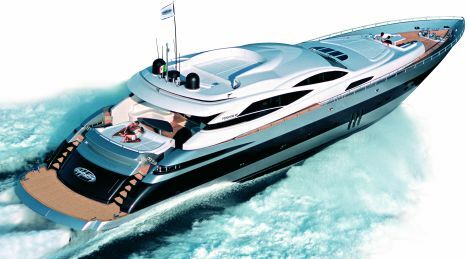 Others developed a model that exclusively uses gas turbines; even though extra tanks may be installed, this type of propulsion greatly penalizes the boat's range, limiting the use of the yacht due to her high operating costs. Of course, even our solution has high operating costs and a reduced range if the yacht navigates at maximum speed, but how many times will this happen? When will the Owner really want to navigate at maximum speed? In our opinion the maximum speed would only be a percentage of navigating time. On the basis of common experience, the rest of the time, cruises are done at a cruising speed that for this type of yacht would be approximately 37/38 knots. At this speed, if the yacht only uses the MTU engines, consumption is absolutely in the average, while at maximum speed consumption is quite high. In this perspective, we calculated a range of 400 miles. With the other solution, with the same hull and the same cruising speed, range would be drastically reduced, almost 50 per cent. In our model, the turbine is not always on, but it is switched on when the boat is already sailing at 42 knots propelled by the 3,700-hp MTU engines. Then, by simply pressing a button, the starting process of the gas turbine is on and after thirty seconds additional power is generated. What is the approximate fuel consumption with the gas turbine on? What does actually occur when "I push the button"? Simplifying, I can say that everything is under the control of a remote black box where electronics regulates the optimal operation and management of the turbine. This considerably facilitates its use with the simple pressing of the above-mentioned button and the operation of an additional lever similar to the one used with diesel engines. By pushing the button, a sequence of automatic actions starting the turbine engine shaft is initiated. When this shaft reaches an "x" number of rounds and a given air pressure is created inside the combustion chamber, thirty small spark plugs produce sparks all along the inner circumference of this chamber. At this point, fuel at high pressure is injected and when it vaporizes, it burns using pressurized air as combustive starting the turbine. If we measure the turbine power in percentage terms, the minimum is around 42% while the maximum is around 97-98% even if the turbine may produce up to 105% of its nominal power for just a brief moment. How can this extra power of 5,000 hp be controlled? Simply by using the lever, as is the case of any engine. In this way one can request the turbine to supply the exact amount of power - little, much or the maximum. Does this third booster participate in steering? No, it is just used as power booster. 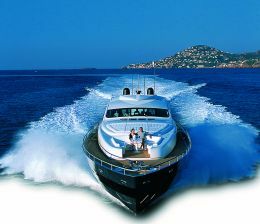 Steering is done simply with the two lateral water jets of the MTU engines. The installation of three water jets was a precise and a well-considered technical choice that, as opposed to others using mixed systems based on surface propellers/water jets, makes the vessel less influenced by weight and with a definitely more uniform and efficient lift. Calculations showed that when the vessel sails at maximum speed, each MTU/Kamewa combination contributes with a trust of two tons to the original overall lift of 13 tons greatly facilitating steering. Who developed the electronics governing this system? We preferred to use products of one single supplier: MTU. We managed the fine-tuning of different parts with electronics. What type of maintenance requires the turbine? It must be protected from sea sprays, from the mixture of water and salt sprayed by the wind that can enter the turbine's suction ducts. In any case, the system should be washed from time to time, with freshwater and sometimes with solvents and this operation should always be carried out with freshwater after sailing in rough seas. Mr Frabetti, how did the Ferretti Group's engineering expertise contribute to all this? We carried out the project of the hull offering maximum support to Pershing, as we always do with all Group's associates. According to Mr Tilli Antonelli's indications, in the 2002, we created a hull with waterlines offering high performance both at 40 knots as well as at 55. 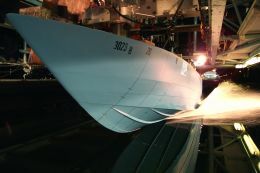 In addition to the normal design carried out with the computer, which, thanks to modern techniques and data collected in time from our experience, is extremely reliable, we went to Sweden, where we worked in a ship model testing basin side to side with Kamewa technical experts, refining the hull. 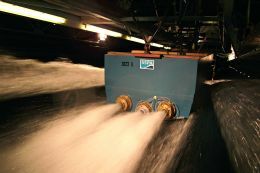 We mainly worked on the underwater areas subject to the pressure generated by high speed, in the area of the water inlets of jets. Studying the inclination at which these inlet ducts must be installed, for example, may seem not important, nevertheless it is a function of the estimated speed of the vessel, of the specific needs of the type of pump to be installed as well as on the trim the vessel will have under navigation. This, in turn, depends on the center of gravity, therefore also on the design speed or speeds. Because of this we modified the inlets inclination in the 55-knot version for better performance this indicates that we took just small, yet very efficient, hydrodynamic modifications, which nevertheless improved the overall performance. We refined aspects that had been contemplated since the beginning, when we were working in the ship model-testing basin with Kamewa experts, and we developed them according to Mr Antonelli's concepts. He did not want the fastest hull ever, rather a yacht that even at maximum speed could offer good seakeeping abilities, great comfort and above-standard safety: the essence and epitomes of the trademark. We tried to satisfy him by designing hull and structures according to his request. When we were told to design a Pershing 115 version with turbine and water jets we did not have to work hard. Since we believe that every type of hull is made for a given type of engine, at least we did not have to redesign anew the boat, as we generally do. Even though we chose the water-jet propulsion for this version, the design of the slower version might apply, if it were not so, we would have to completely redesign the hull. This solution would have been more convenient rather than risking building a 115 footer that would not meet the Pershing standards or, worse, that would not navigate properly. As we do own the necessary technology to drastically reduce the time that goes from the design phase to the faithful realization of a new mold, we prefer losing some time rather than risking a flop. Then, even though the boat has not yet been launched, you have confidence in her seakeeping abilities, her speed. I can say that we designed the yacht propelled by two 3,700 hp MTU engines with the speed target of 41 knots. After model tests with a seven-meter model, that is, in a 1:5 scale, this speed was confirmed for the completed ready-to-sail yacht. On the first effective sea trial, the center of gravity, trim and seakeeping abilities at 42 knots were the same as the estimated ones. Frankly, no one ever has a sound sleep before sea trials, nevertheless, all results, demonstrating the validity of the design, allow us to have confidence in this new and faster version. Gas turbines preferably need pure and cool air as the one found in the mountains. 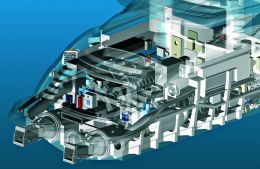 How did you solve all the problems related to marine propulsion? As for the use of air that is not cool, like the one existing above the sea surface, the engineer solved this: the loss of efficiency that this situation involves was calculated. How should the air be cleaned? This was a good challenge. First of all, the turbine needs to be fed with the right amount of air and for this we created extra openings that do not modify the hull's aesthetics and which open as soon as the above-mentioned button is pressed, thus avoiding lack of air pressure in the engine room. The air that due to speed enters in them is conveyed to special filters that clean it from impurities. The vapor-like brackishness mixed with air and water, is collected by these filters and cleaned thus preventing it from reaching the turbine mechanisms. Do not think of sponge-like filters, they rather resemble a winding path, generating a sort of Venturi effect, in which particles, in this case the impurities, are trapped knocking against the ducts' surface. After this, the air that is introduced in the turbine, at a temperature of 40/50° Celsius, is heated to 500° Celsius inside the burner. The main challenge was to drastically reduce the temperature of the exhaust gas to 70°/80° Celsius in a short exhaust hidden under the aft platform. We carried out fluid dynamics research studies for checking how the hot gas jet behaves inside the duct and whether it cools down evenly, without temperature peaks. Thus we designed a water-cooled exhaust, which acts on the gas in a uniform and constant way; it seems very efficient. Then we added "traps" to prevent the water from flowing backward from the exhaust to the turbine, something that could eventually occur with a sudden slow down and that would be potentially damaging for the system. At this point, we would like to refer the reader to a next issue of Superyacht. By then, we should have had the possibility of getting on board of this new version of the Pershing 115 and of describing the sensations offered by the gas turbine. For the moment, we report below the description of the interiors of this flagship designed by Fulvio De Simoni, a consolidated name of Pershing yachts. 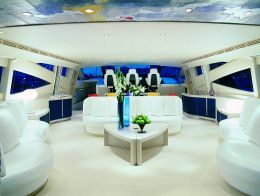 There are several stylistic elements worthy of distinction in the Pershing 115 layout such as the open-air dinette on the bow area, with foldaway table and Bimini top, the exclusive and innovative sundeck and the large cockpit that may be used night and day. The day area is divided into four separate sections: a relaxation area with three C-shaped sofas; a dining area with extendable table that seats 12; the navigating deck which can become a pilothouse for the master's exclusive use; and, finally, an intermediate deck that makes it possible to exploit to the maximum the volume beneath the deckhouse, consisting of a room with a private study, a TV area and a day head. The night area consists of a VIP stateroom in the bow, two guest cabins with twin beds and the full beam master stateroom with two ensuite bathrooms. The crew quarters are aft. 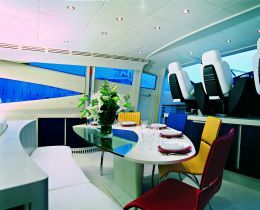 They have independent access and include the galley, a crew dinette and three twin cabins. The engine room can be accessed directly from here. Aft, there is a fully fitted garage for launching and hauling of a tender and eventually, of two PWCs. The Pershing 115 has all the distinguishing characteristics of the Pershing yard, such as innovation, maximum comfort throughout, high performance and original design.